Photos from Chinese websites (e.g. FYJS.cn) show the first FC-1 Xiaolong bound for the Myanmar Air Force at Chengdu Aerospace Corporation’s (CAC) facility. The specific aircraft at CAC shares the standard camouflage and tail insignia of the Myanmar Air Force. 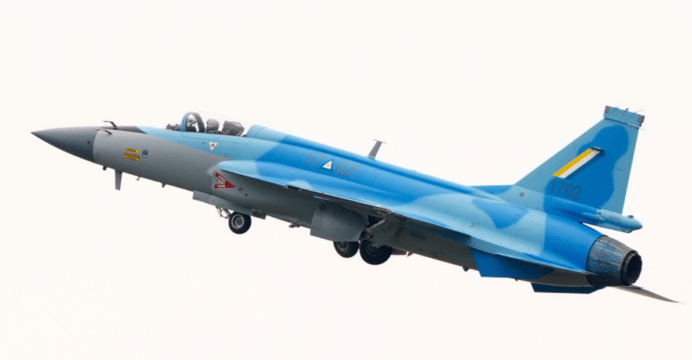 Myanmar was reportedly the launch export customer of the FC-1/JF-17 platform, signing a contract for 16 fighters during the 2015 Paris Air Show. Reports emerged in February that Myanmar was also in talks with the Aviation Industry Corporation of China (AVIC) to produce the FC-1 – possibly the active electronically-scanned array radar-equipped Block-III variant – under license. Bar the Mikoyan MiG-29, the Myanmar Air Force comprises of Chinese-built fighters, namely the Chengdu F-7 and Nanchang A-5. The FC-1s will likely supplant the F-7 and A-5 in the air defence and attack roles, which would basically transition those squadrons into multi-role units. Specifics, such as the configuration of Myanmar’s FC-1s, are not known. However, it is worth noting that Israel appears to be one of Myanmar’s defence suppliers. Building a local technical base for the FC-1 could enable Myanmar to customize its fighters using subsystems and weapons of its selection. When the twin-seat variant JF-17B conducted its maiden flight, AVIC said that it had already secured sales for the type. It is possible that the customer for the twin-seat variant (FC-1B) is Myanmar. The JF-17/FC-1 was initiated as a joint-program between CAC and the Pakistan Aeronautical Complex (PAC) in 1999. It conducted its maiden flight in 2003. The JF-17, a subvariant configured by PAC for the Pakistan Air Force (PAF), was brought into service in 2010 with the No. 26 Squadron Black Spiders. By 2011, the PAF phased-out its Nanchang A-5 fleet with the JF-17. Since then, more than 80 JF-17s were delivered to the PAF, which are in service with five squadrons in each of the PAF’s three regional commands. In 2015-2016, the PAF began the process of raising a sixth JF-17 squadron. The sixth unit will likely complete the phasing-out of the PAF’s legacy Chengdu F-7P fighters. In terms of exports, PAC and AVIC also secured Nigeria as a buyer (for three aircraft) in 2016. Efforts were also made to pitch the platform to Azerbaijan, Sri Lanka and Qatar.